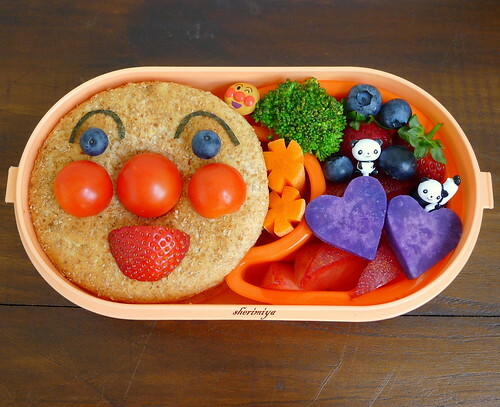 Anpanman Sandwich Bento, a photo by sherimiya ♥ on Flickr. I'm posting this Anpanman sandwich I made earlier this summer but forgot to post, in keeping with the theme from today's snack. I was chatting with my pals on twitter last night about Anpanman and his delicious foodie friends, which include Currypanman, Melonpannachan, Shokupanman (which I ate this afternoon), and others with equally intriguing names and heads shaped to resemble their names. I wish we could watch the Japanese series, just so we can see what kinds of characters show up on each episode. This turkey and cheese sandwich is made with bagel thins, decorated with cherry tomatoes, strawberry, blueberries and nori to create Anpanman's face. On the side I packed some more berries, Okinawan sweet potato hearts, broccoli and carrots. I rarely use this box, but it does seem to fit this bread perfectly well, doesn't it? 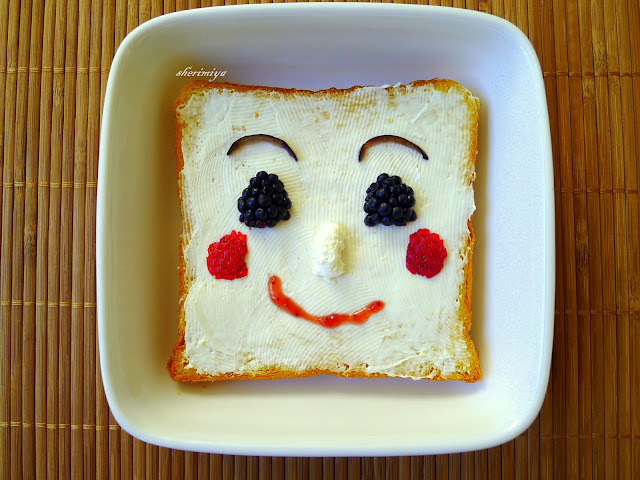 Shokupanman is a slice of sweet potato bread, smeared with cream cheese, and decorated with blackberries, strawberries, grapes and jam. He was delicious~! I've heard of Anpanman but never really seen the series. I really love your Shokupanman! Those berry eyes are so expressive! Kinda like saying, please don't eat me, I'm too cute. haha! These are so cute! Check out the new bento meme at Bento Blog Network. This week's theme is Anything Goes and you can post your bento links until 8pm CST on Tuesday and then voting will be enabled for people to pick their favorite, which will become the featured bento of the following week. This theme specific meme is posted each Friday. Next week's theme will be Smiles.